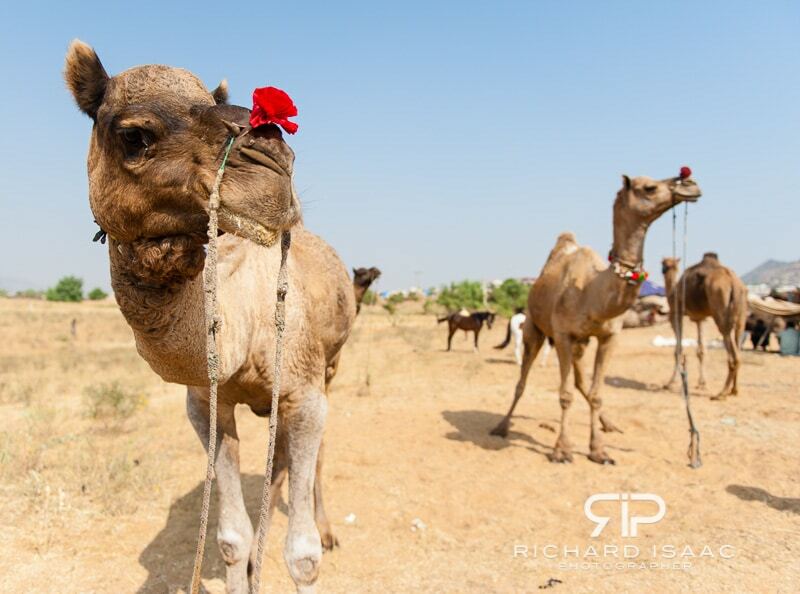 This is the fifth and final blog post from my two week trip to India covering the last destination in my tour of Rajasthan – Pushkar. Links to the others are at the foot of the post, and editorial usage licenses and professionally produced fine art quality prints can be bought for all images by clicking here. So far I had experienced firework-laden Diwali celebrations in Delhi, lakeside chilling and hillside trekking in Udaipur, the spectacular marble Jain temple near Ranakpur, and desert fort life in Jaisalmer. However I had timed my trip so as to leave what I was expecting to be it’s highlight until last. 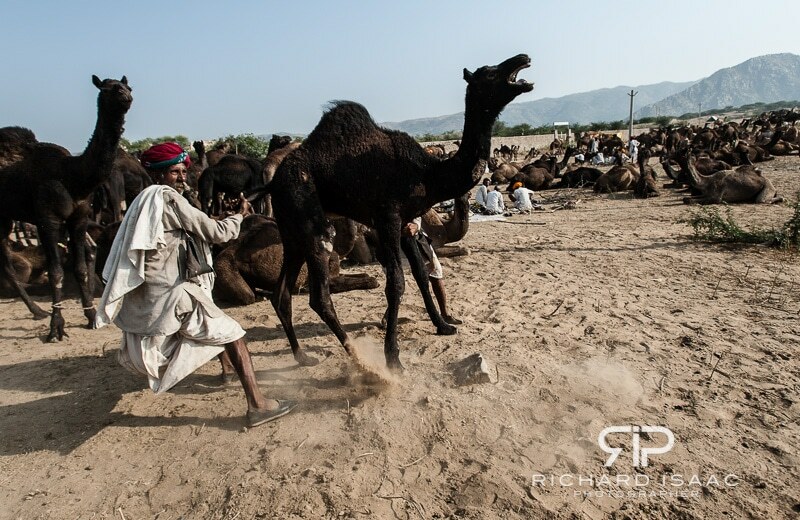 Pushkar is home to the famous Pushkar Fair, one of the largest camel fairs in the world. Spanning five days it begins around early/mid November on Prabodhini Ekadashi, the 11th lunar day in the Hindu month of Kartik, lasting five days until the full moon day Kartik Poornima. 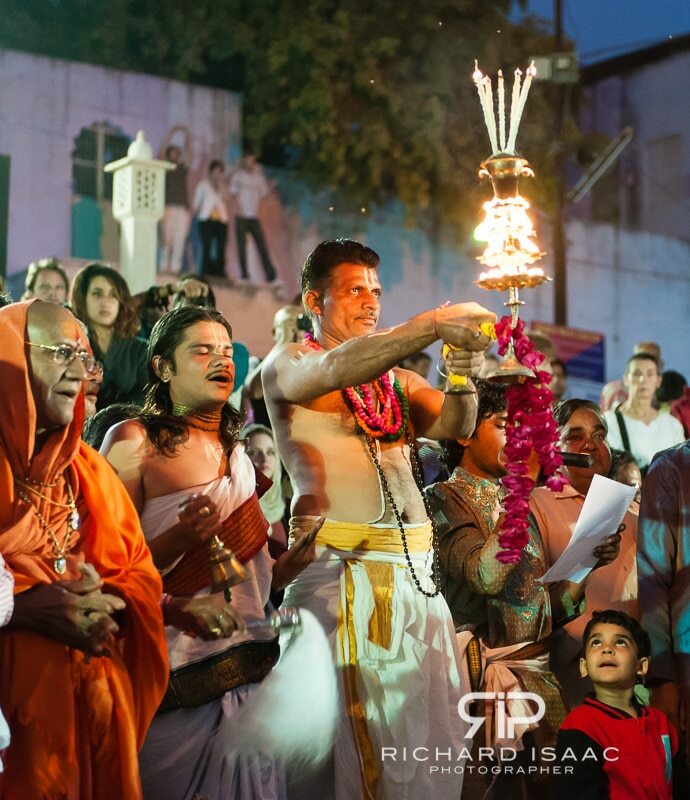 The timing of the festival is also of religious significance. 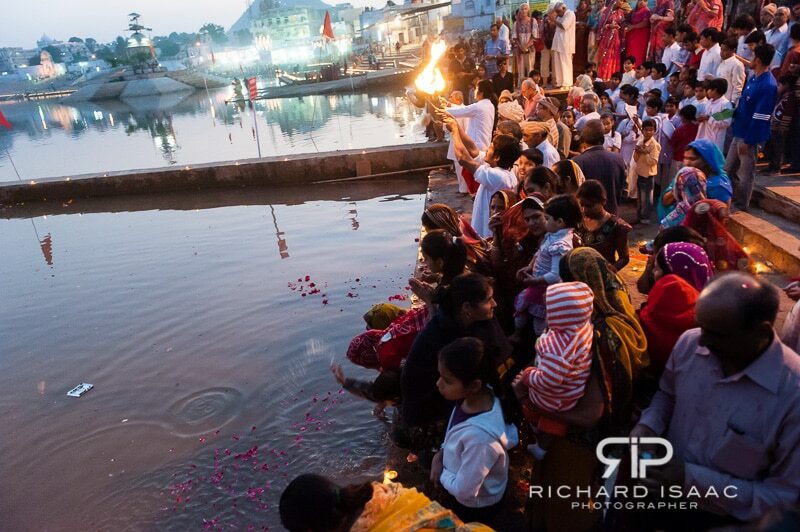 The final day of the festival on Kartik Poornima according to legend is the day on which the Hindu god Brahma dropped a lotus flower to create the Pushkar lake. 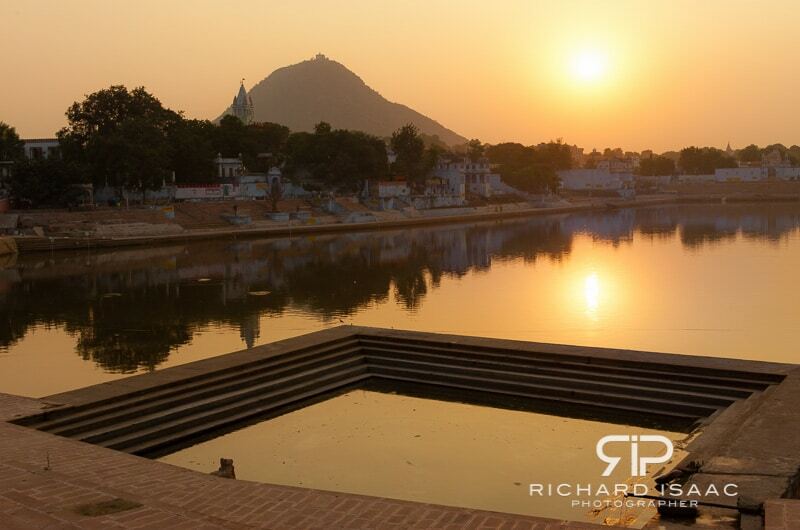 Hence the lake is considered holy, Pushkar a key Hindu pilgrimage town and Kartik Poonnima the day for a major spiritual and religious festival drawing thousands of pilgrims and devotees from across India. 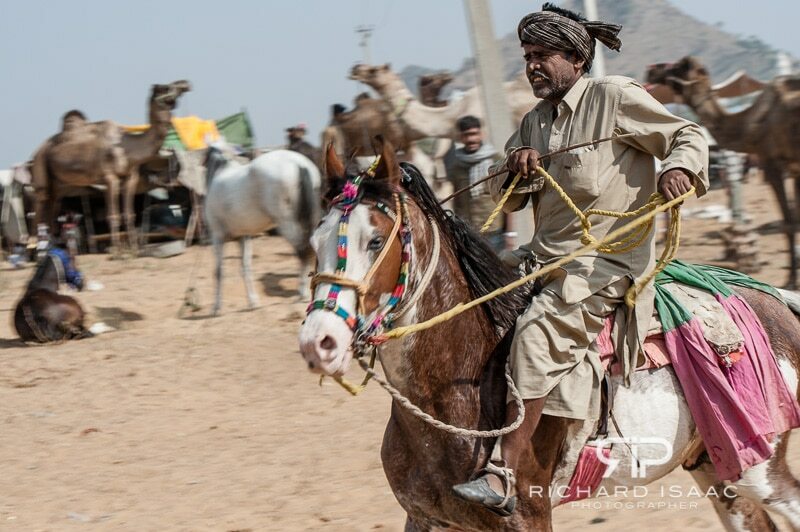 So the fair, the camels, livestock, their buyers & sellers, the festival & its pilgrims, promised to be an amazing combination with which to finish my trip on a high. 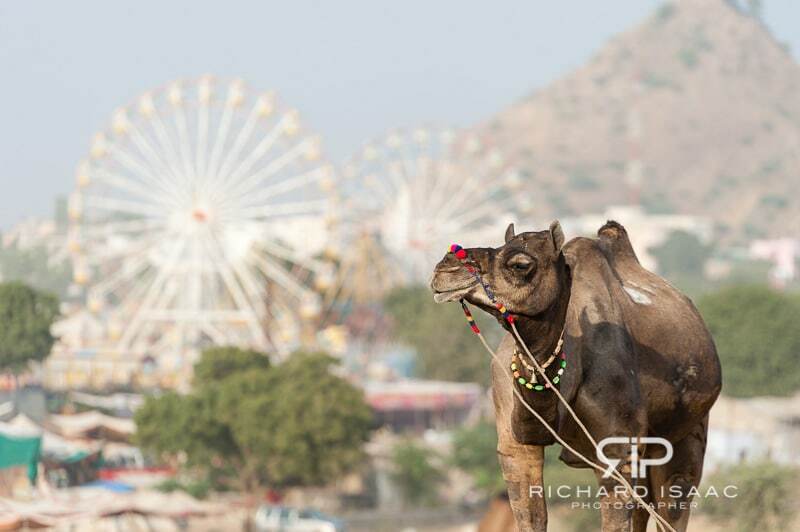 Ideally I would have liked to have been there for the full duration but given I only had two weeks in India and definitely wanted to catch the start of Diwali in Delhi, it meant I would only be able to be in Pushkar for the first two days of the fair. I was happy with this as the business end sounded interesting, and I hoped that I would still get to experience some of the religious side of things. 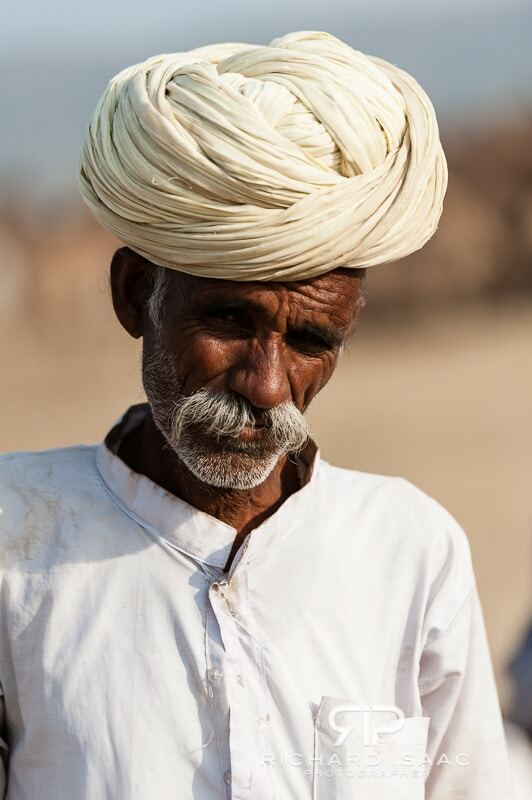 I arrived at about midnight after a long ten hour drive from Jaisalmer, ate a farewell meal with my driver, and went to bed. I woke early the next day and had breakfast on the rooftop of my hotel, which I’d chosen especially as its website claimed it to be one of the tallest buildings based right in the centre of Pushkah with excellent views over the town. It wasn’t wrong – I ate my pancakes watching troupes of macaque monkeys playing on the rooftops of the buildings below, what a great start to my day! After brekkie, I grabbed my gear and headed out up to the fairground. As soon as I reached the street I felt the buzz of the building crowds. Even though this was the first day of the fair and supposedly the quietest as far as tourists concerned, the town was already bustling with activity. Shops, barbers, food stalls, pretty Indian girls in decorative dress and make-up ready to pose for camera-toting tourists in exchange for rupees, it was all going on. I moved with the crowds in the direction of the fairground, just a short ten minute stroll from my hotel. There I found a stadium, a couple of ferris wheels and various other fairground rides and sideshows, some in the final stages of preparation. A schedule I had picked up at the hotel showed that a week long line-up of entertainment was due to start the next day, including dancing camel competitions, camel racing, and the like. 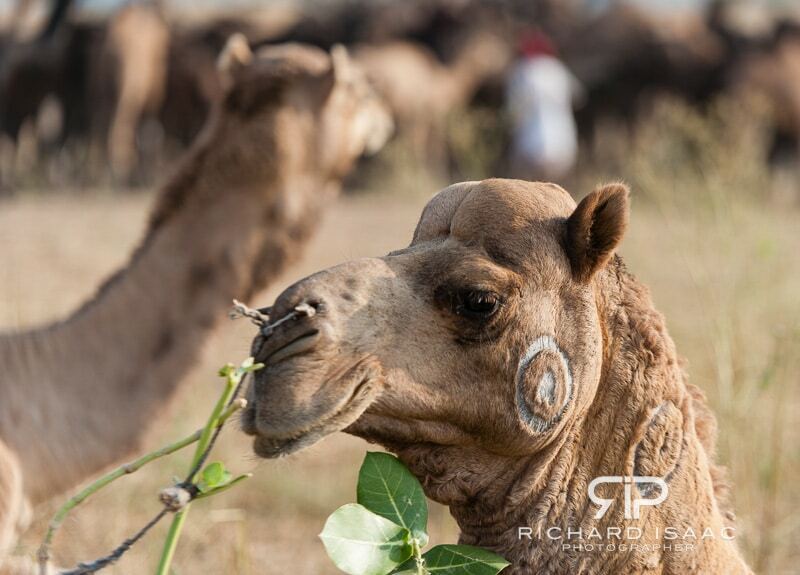 I skirted round the stadium to find the real source of action and interest for me – the camel and livestock fields. 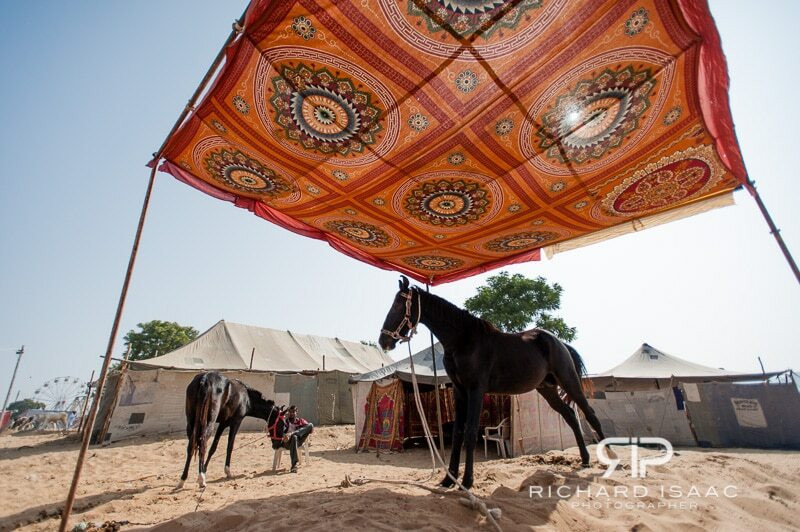 Here thousands of camels and horses were presented in groups or lined up in rows, around watering holes, under canopies or out in the open, together with their owners, all vying for the attention of prospective buyers. 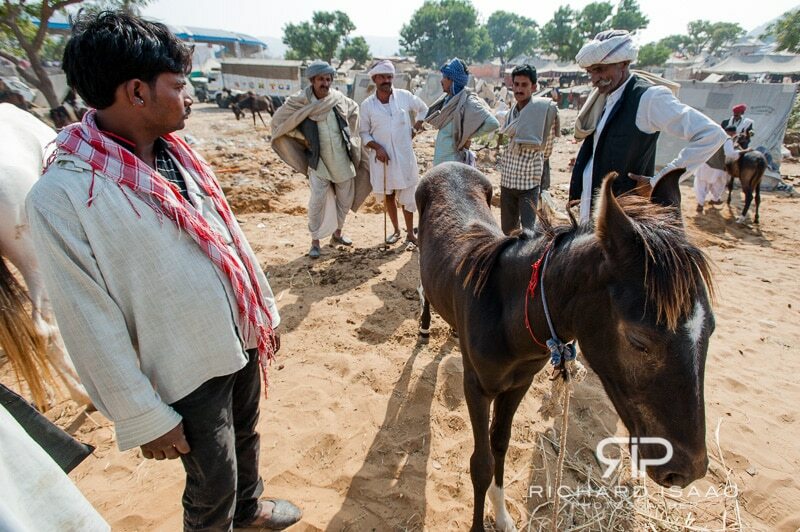 During my three days in Pushkar I made various visits to these fields to observe business being done in various forms. The traders made much effort to make their wares as presentable and sellable as possible. 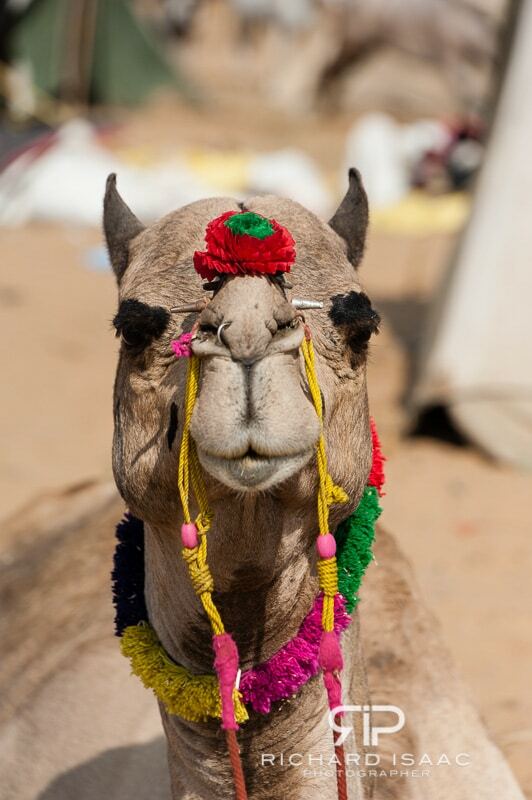 It was amusing to find most of the camels brightly decorated in colourful makeup-like paints and flowers, and with decorative designs shaved into their fur. Prospective buyers ‘test-drove’ horses, racing them up and down through the fields – you definitely had to remember your Green Cross Code and look both ways before crossing to avoid being knocked down! Negotiations were happening, poker faces were been worn, there was much whistling through teeth, and deals were being done. 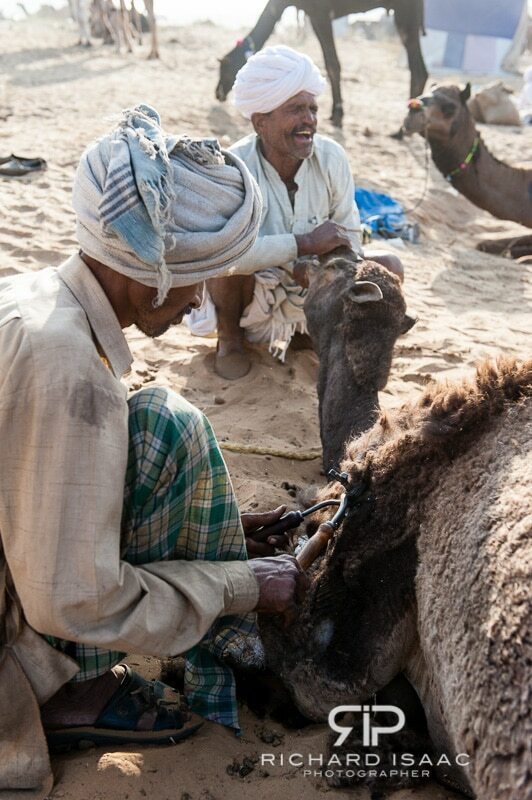 The camel owner has a sideline giving girls brazilians – ouch! 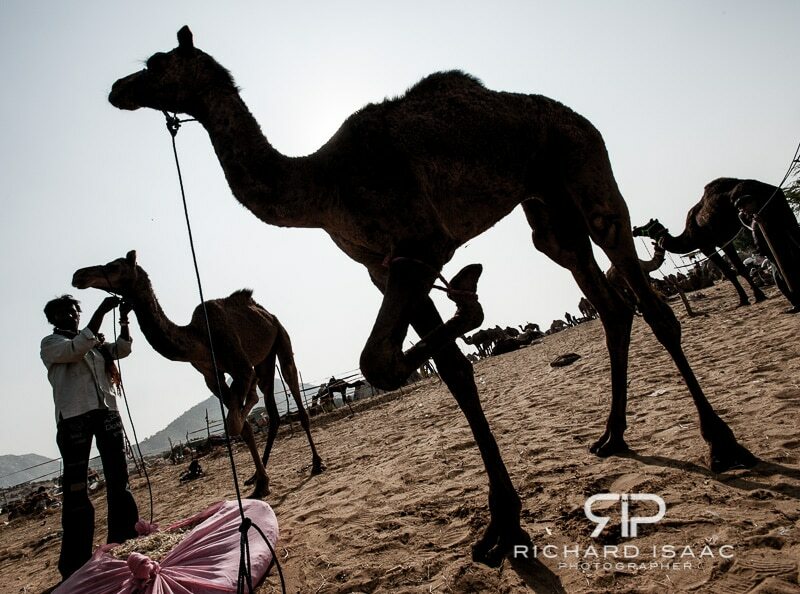 Walking amongst the camels I started noticing the sounds they made as they interacted with each other. A common form of expression which emanated from them was what sounded like one were gargling with a throat-ful of phlegm – apparently this meant ‘I’m hungry’. I can verify this personally, as a couple of times I strayed too close and a hungry camel mistook my green camera bag for a bunch of leaves and went in for a nibble. 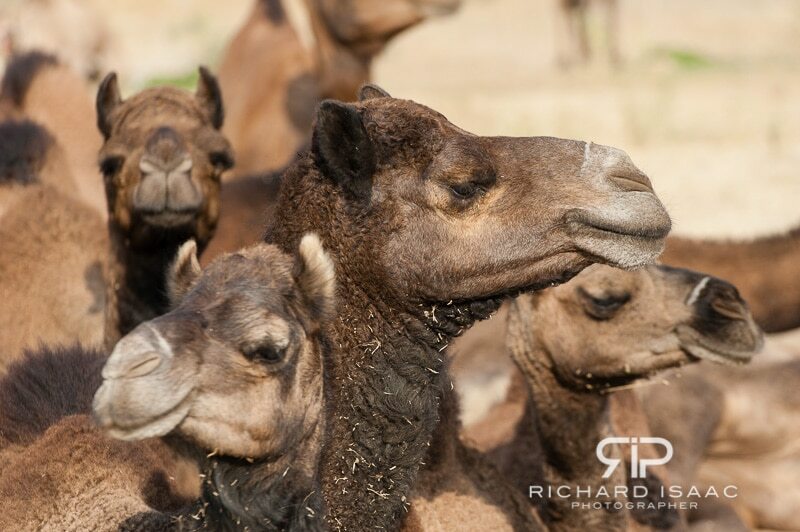 Every now and then a camel’s discontent would ramp up a few notches and they’d start taking their frustrations out on each other, which was when a pecking order in the camel hierarchy became evident. 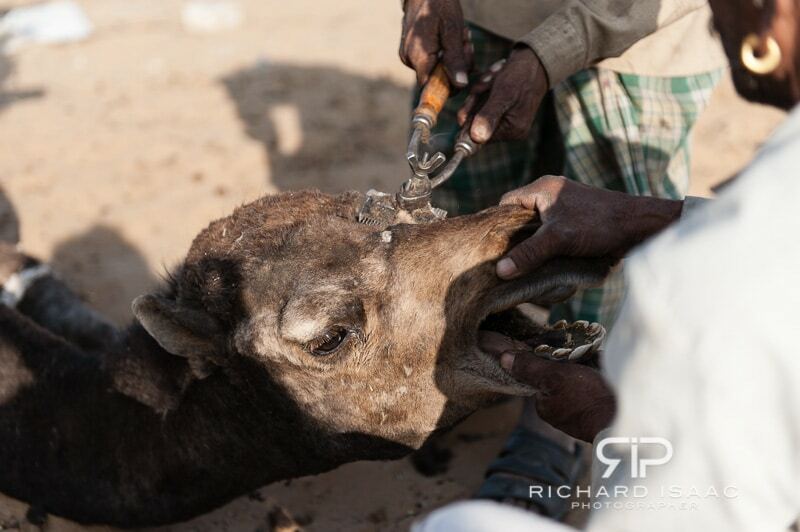 You’d frequently see a dominant camel exerting its authority over a lesser camel, they made tactical use of their long necks in a certain method of attack that was definitely below-the-belt – I saw more than a few ‘goolie’ attacks in the couple of days I was there. The most explosive situation I witnessed was on my second day there. 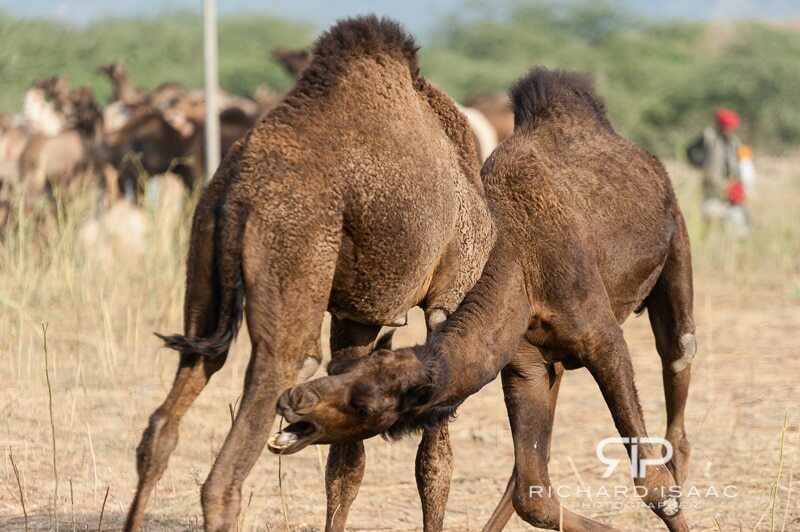 I had come to recognise the sounds of an irate camel, on hearing the loud hissing and gargling of one such camel fairly close by I looked over to see it rearing up on its hind legs amidst the pack having a major sense of humour failure. I jogged over to find an amusing spectacle comprising of this grizzly camel’s owner holding onto its tail, digging his heels in the ground in an effort to restrain it. However it was not enough to hold this bad boy back – the camel reared up again about shake off its struggling would-be master and make a run for it. 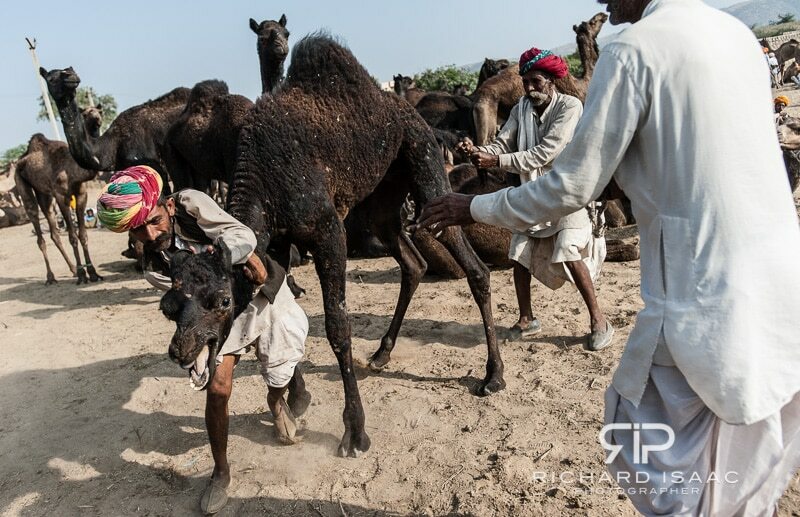 However a couple of other camel traders saved the day and rushed in to assist their comrade, one of them showed it who was boss by getting it in a headlock and dragging it to the ground. 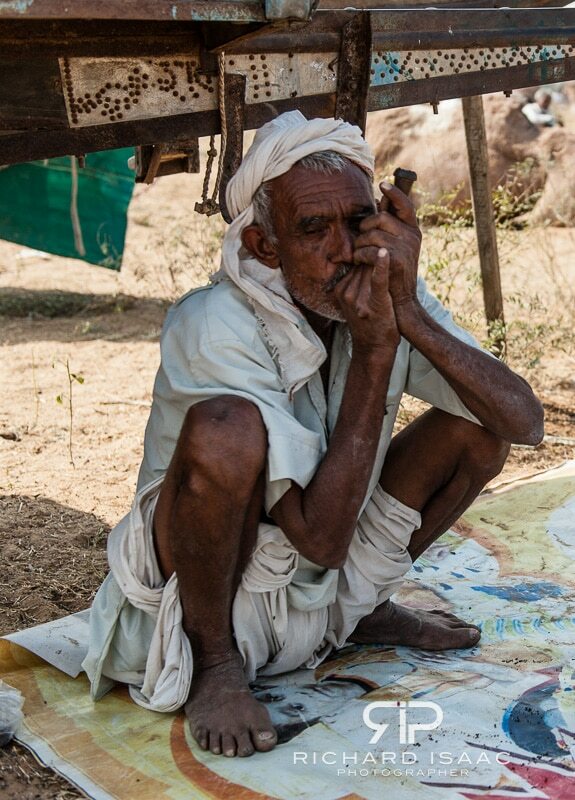 During the days spent exploring the camel and livestock fields I noticed that gradually the deals were being done, business was being completed and the camel traders began to decrease in numbers as they ebbed away into the desert and left Pushkar. At the same time the activities in the fairground and stadium stepped up a gear and the fair’s schedule of entertainment started. 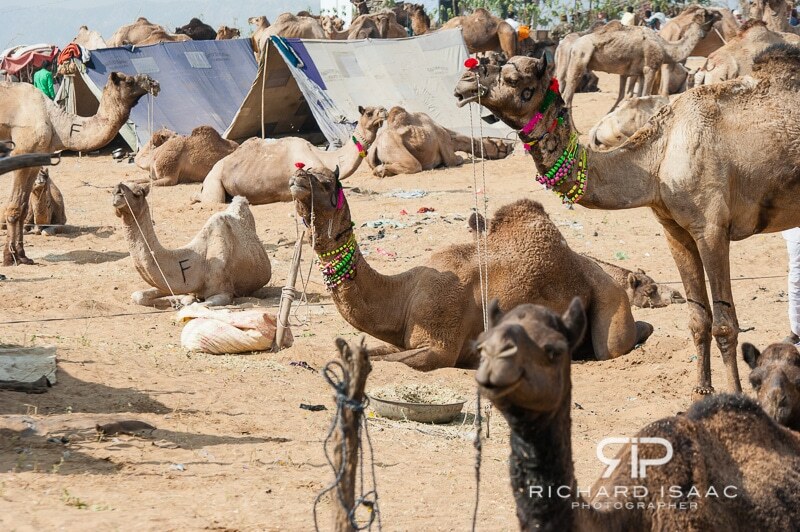 Though my interest lay more in the camel and livestock trading I stopped by the stadium a couple of times to check out what was going on. 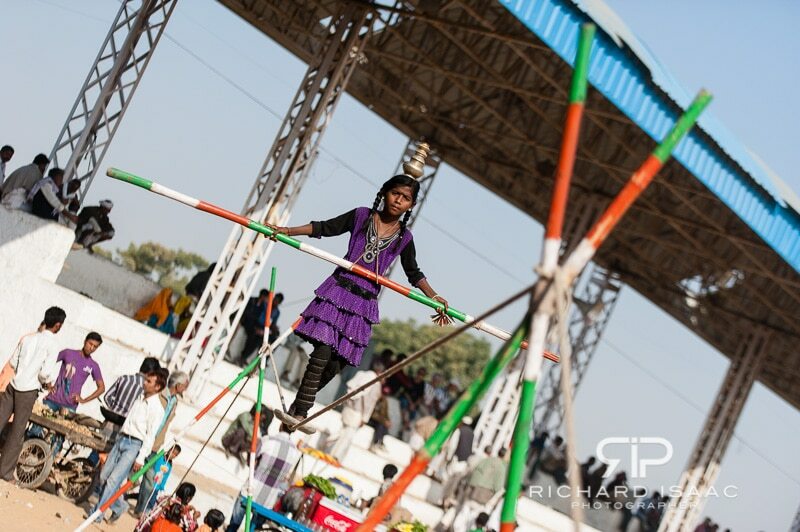 The lighter entertainments included tightrope-walking Indian girls who would do their thing up and down the rope balancing pots on their heads, now and again throwing in a major wobble for dramatic tension. 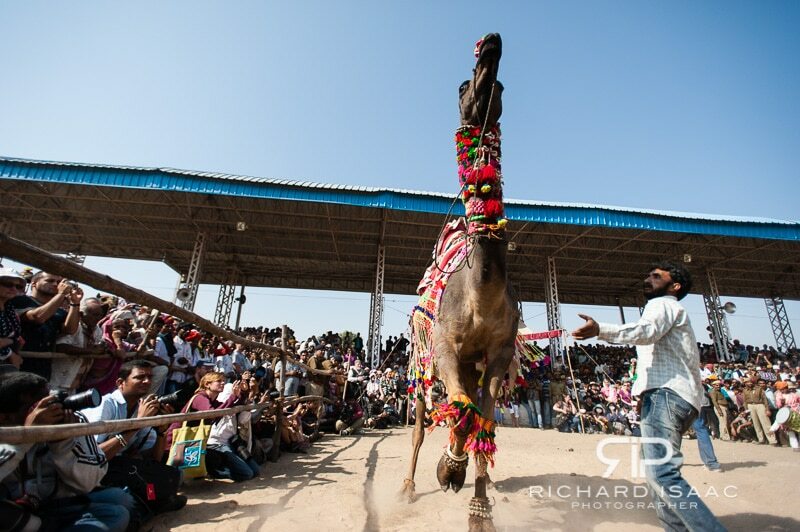 Whilst things like these were going on, to the side stood groups of camels and horse being prepared for the main spectacles such as the dancing camel and horse competitions. My time in the stadium was relatively fleeting, but I managed to watch a couple of the latter. These were the real crowd pullers and packed out the stadium with both Indian and foreign onlookers alike. The first thing I noticed with amusement was the amazing spectrum of quality in the contestants. A couple of camels looked like they could have been randomly plucked from field that day, to spend their 10 minutes of showtime being dragged round the arena by a peg through their nostrils, beaten with a stick as an ‘incentive’ to ‘dance’. Some of the horses where almost as poorly trained but received less harsh treatment, whilst others were impressively well trained in comparison to the rest. 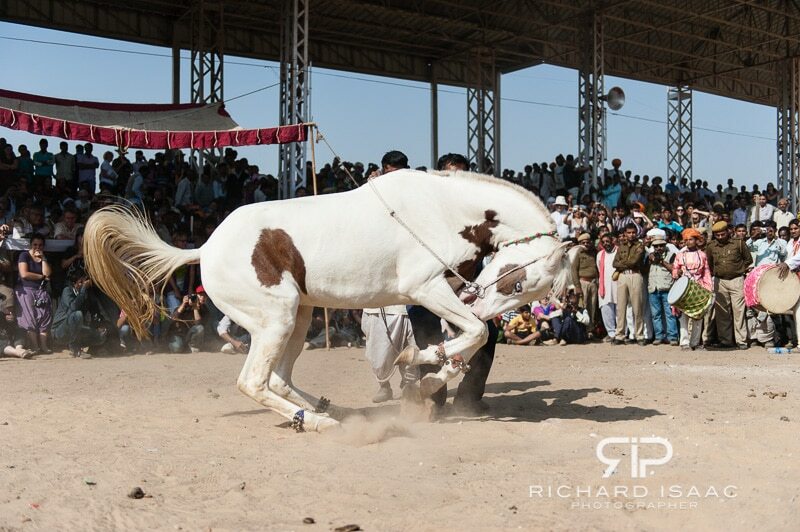 The white horse in the picture below ‘danced’ and reared up with total control, every muscle in its body as taut as a bowstring. 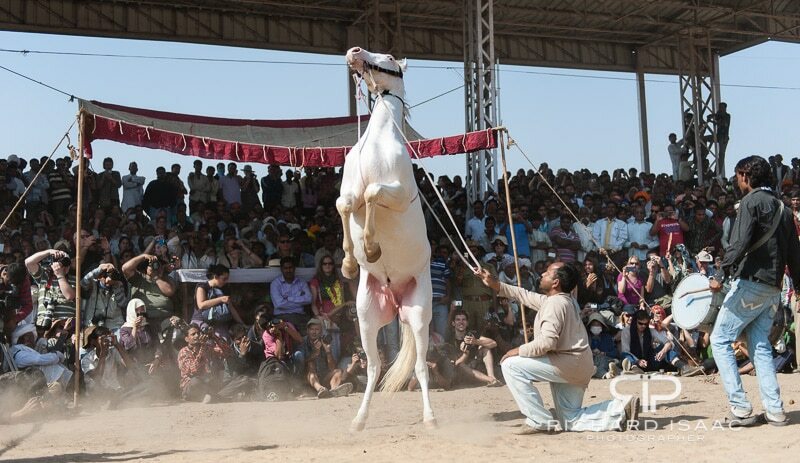 I doubt however whether you would see the training techniques implemented on those horses in use by any western trainer! During the course of each day I would return back to the village for some time out, food, and to explore the town, particular the many bathing ‘ghats’ along the perimeter of the lake. The lake itself as I have mentioned is sacred amongst Hindu’s. It’s referenced on coins as far back as the 4th century B.C. as well as on amongst inscriptions on the Buddhist stone structures at the village of Sanchi dated around the 2nd century B.C Thus it is a set of major spiritual importance with the Hindu scriptures designating it a “Tirtha-Raj” – the King of water-related pilgrimage sites (one of five) – and one of the most sacred sites in India. To bath in the lake is said to offer spiritual cleansing, over the years this has led to the creation of 52 bathing ghats – stone steps descending to the lake edge – which are used for sacred bathing practices and rites. 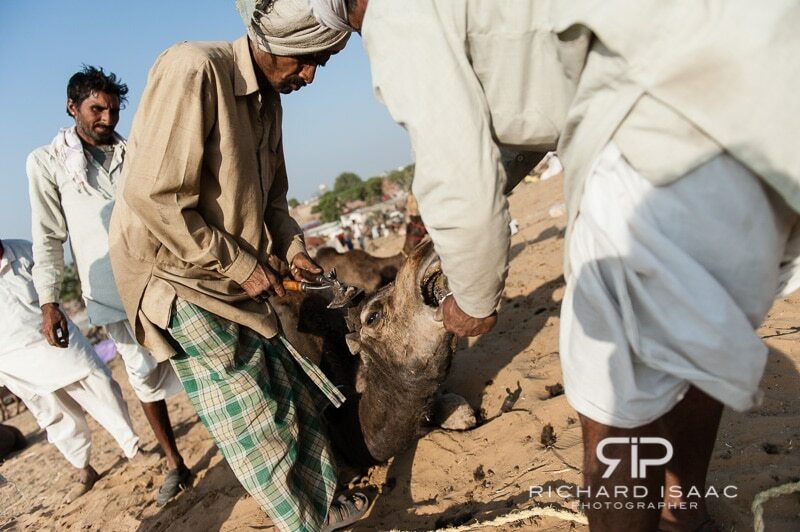 I read in the fair schedule that one such religious ceremony was scheduled to start at 6pm/sunset on my first day in Pushkar. So after a day’s exploring the camel fields, I decided to head to the lake to witness this. Walking through the streets towards the lake I noticed the sound of music coming from it’s direction. As I neared the lake the music’s volume increased, it became apparent that it was amplified through loudspeakers and I realised it was accompanied by the voice of a man chanting, repeating some kind of mantra over and over. I arrived at the tops of the steps to one of the bathing ghats at the water’s edge and saw masses of people gathered there. Not just at that one ghat, but from what I could see the majority of the ghat’s sitting along the edge of the lake that the town sat on. 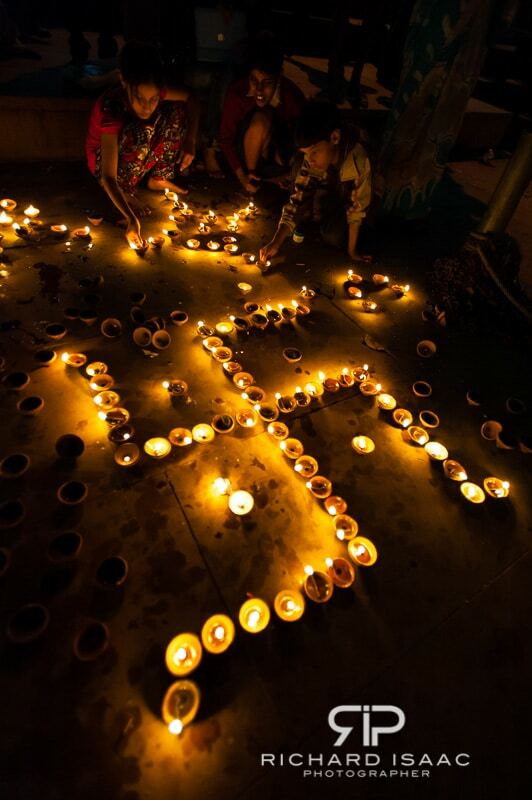 There were hundreds of people clustered around each ghat taking every available square foot of space, many were carrying lamps or lighting candles along the waters edge, others just watching. Against a backdrop of the setting sun and darkening sky it seemed the whole town and lake was lit up. The mass gathering of people, the key and volume of the music, together with that of the mantric chanting was such that iI found both incredibly hypnotic and uplifting in equal measure to the paint that it made my hair stand on end. 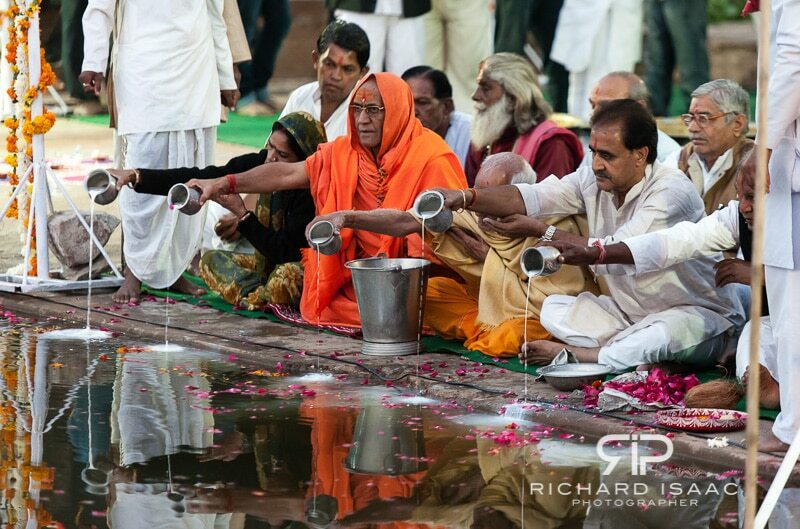 From what I could tell, the ritual that followed involved a number of people (who must have put themselves forward previously) as the focal point of the ceremony, lined up on the ghat at the waters edge and surrounded by holy men. It was one of those holy men with a microphone who was responsible for the captivating chanting. 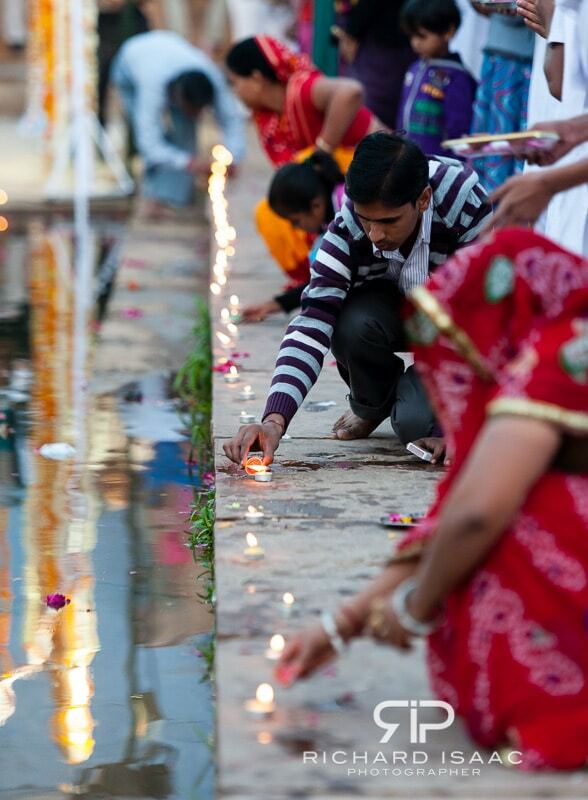 During the course of the ceremony the volunteers in question gave offerings for the Hindu god Brahma, were splashed with holy water from the lake, decorated with flowers, and received blessings for both themselves and their families in return. 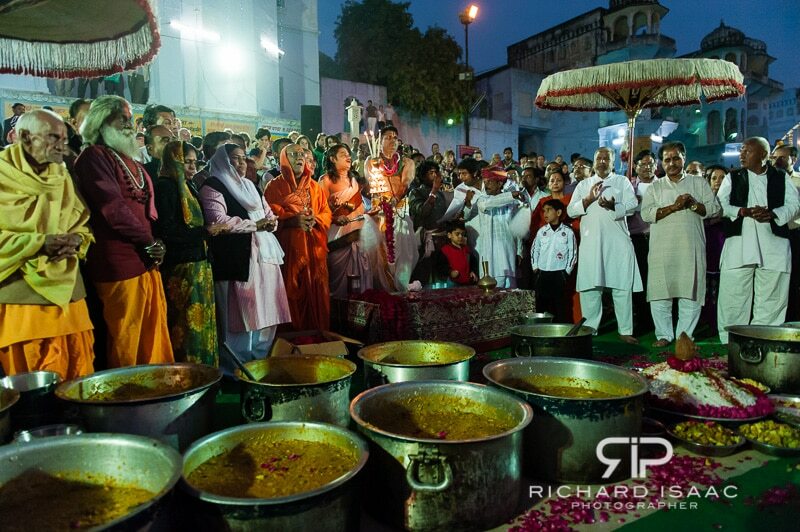 The ceremony took about an hour, the music and chanting continued throughout but building in intensity, with the ceremony finally climaxing as big vats and pots of food were brought out and and ladled out to the throngs of villagers. 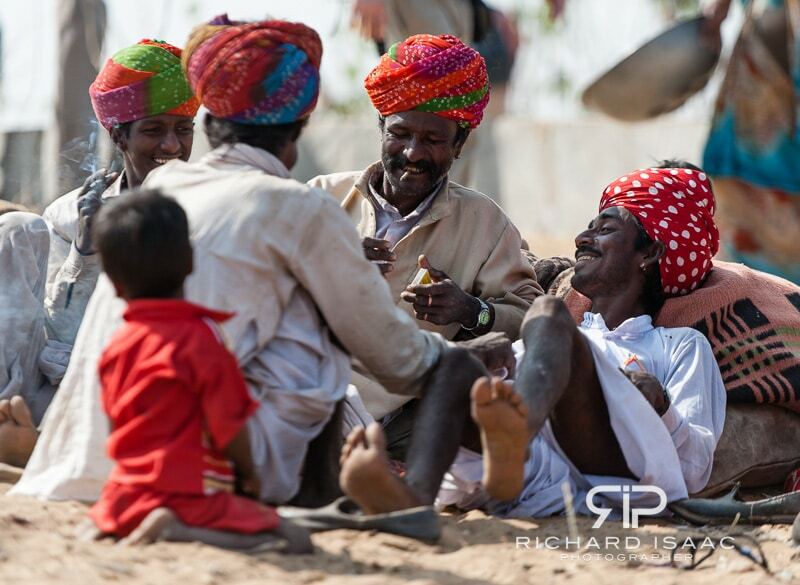 I had been told by friends and travellers who had visited Pushkar that the town was spiritual – at that moment I truly felt it. This felt to me another classic example of religion and spirituality being used to bring people together and do good, and reminded me of my time in the Gurdwara Bangla Sahib Sikh temple in Delhi where I saw local poor people being fed in the temple’s Langer. 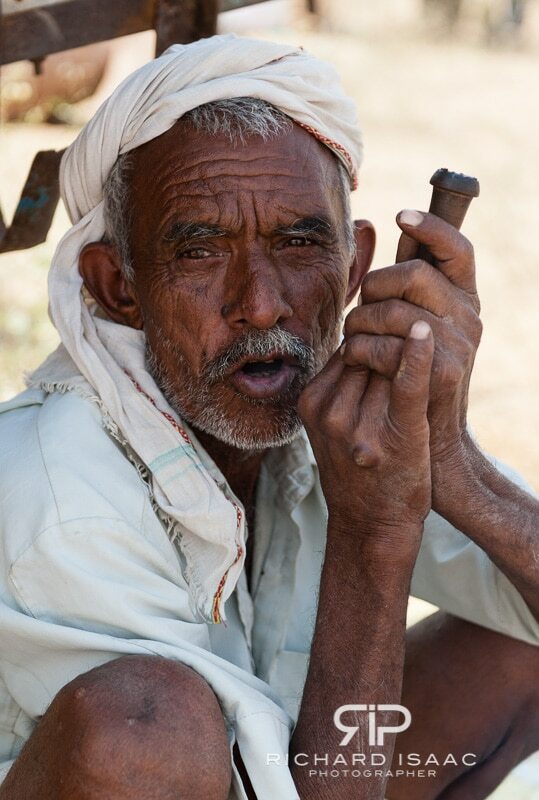 That concludes my little blog on my trip to India, I hope you’ve enjoyed it or that it has been of some use. It was my first time to the country and I couldn’t have done without India Mike, an enormously useful online community for those interested in travelling in India. It has masses of useful information and inspiring posts, check it out.